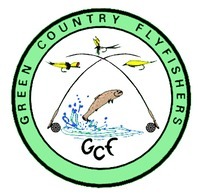 The purpose of the Green Country Flyfishers is to promote, cultivate, and advance the art, science and sport of fly fishing as the most sportsman-like and enjoyable form of fishing and the method most consistent with the preservation of and sound use of our game fish resources. Meetings 7 p.m. on the first Tuesday of the month at East Side Arvest Bank at the conner of Adams Blvd. and Adams Rd. Bartlesville, OK. The doors open at 6:30 for visiting and the meeting starts at 7. Membership - Annual dues are $20. Come to meeting or contact the Treasurer to become a member. Board Meetings All members are welcome at Board meetings. Contact the President for date and location of next Board meeting. The Constitution and By-Laws of the Green Country Fly Fishers are available for downloading by clicking here.